Many Coloradans consider the mountains to be their home away from home. Whether they’re avid skiers, hikers, climbers, or mountain bikers, the fresh piney air is where they’re most comfortable. Luckily for us, there is an abundance of native material and plants that can be put to use creating Rocky Mountain-Inspired landscaping at your home. The Rocky Mountains are a medley of beautiful stones. From sandstone to granite to moss boulders, these can make interesting elements in landscaping, especially when incorporated with Rocky Mountain trees and plants. Beyond simple accents in your landscaping, they can be used for patios, walkways, and retaining walls. Our climate in the front range allows for many of the trees native to the Rocky Mountains to grow here with little help. Surely you’ve seen a neighbor with a grove of aspens in their yard, and pines used in landscaping just about everywhere. Evergreens make for great year-round landscaping, and make nature buffs feel right at home. Since there are so many varieties of these trees and shrubs, they can be incorporated into your landscaping in many ways: juniper, with its pale blue berries for ground cover, Ponderosa Pines for shade and privacy, and spruce and fir trees for attractive pillars of your landscaping. Aspen trees are infamous propagators, often sprouting dozens of “volunteers” at a time. When managed properly, they can make for beautiful native landscaping year-round: Their white bark with dark “eyes” is beautiful to look at in the snowy winter and spring; small round leaves in the summer provide for a dappling of sunshine, and seem to transform into bright gold coins in the fall. Prairie sage, prickly pear cactus, and other native plants add to a Rocky Mountain-inspired landscaping, while needing less water than non-native ornamental plants. We can’t forget about Colorado’s favorite flower: the columbine. These alpine flowers can grow in the front range, and they add a uniquely Colorado look to any landscaping. The blue columbine is our state flower, but columbines come in a wide variety of color to suit your preference. Water features don’t have to be fountains and koi ponds. 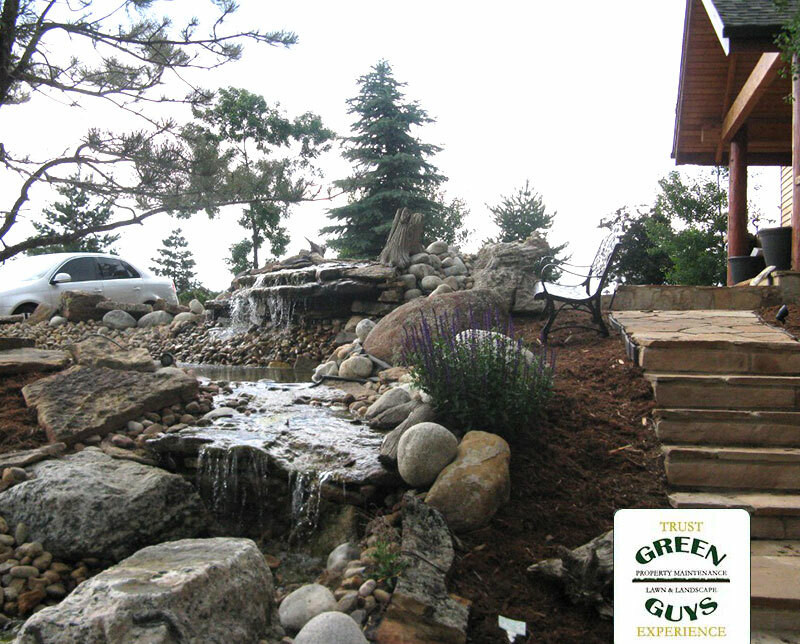 Creating an organic stream in your landscaping can be the perfect centerpiece to a Rocky Mountain backyard. A landscape designer can create rapids or a waterfall with native rocks for dynamic landscaping. Interested in Rocky Mountain Landscaping of Your Own? Get a Quote From Green Guys! Is Sod a Good Choice for Our Environment? When Can Sod be Installed?